This is one of those seasonal summer recipes that I make every chance I get and wait all year long to make. Like most of my recipes, this one’s real simple, but allows for some experimentation, depending on what else is in the market. If you’re not familiar with romano green beans, they’re related to the classic string bean. 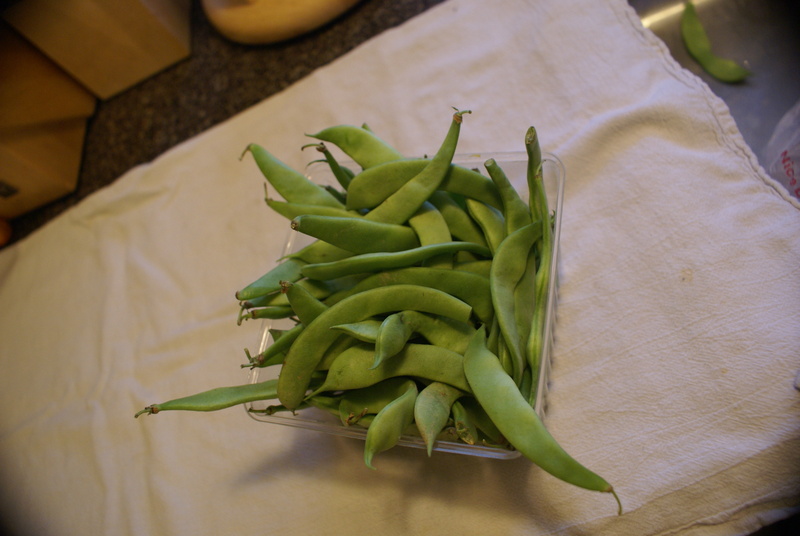 The pods aren’t cylindrical like a string bean, though. They are about 1/4″ to 1/2″ wide and flat. Given their size, they are a substantial vegetable. Whenever I can find these in the farmer’s market, I grab a whole bunch. You could use these like you would ordinary string beans (i.e. blanching, steaming, stir-frying.) I love them pickled with vinegar and pickling spice. But my absolute favorite preparation for these is stewed in tomatoes. And like so many things, I actually prefer these cold the next day. It’s nearly impossible to screw this recipe up. Clean your beans, dice your tomatoes, and cook them together for longer than you think. You can’t really overcook these. You really want the beans to become soft and turn that army green that is supposed to be a bad sign. Here it’s the sign that your beans are done. I’ve provided several optional ingredients that should provide for all sorts of variations. However, all you really need are tomatoes and romano beans. I’ve not tried this recipe with regular string beans. I imagine it would work, but the result would likely be slightly different. 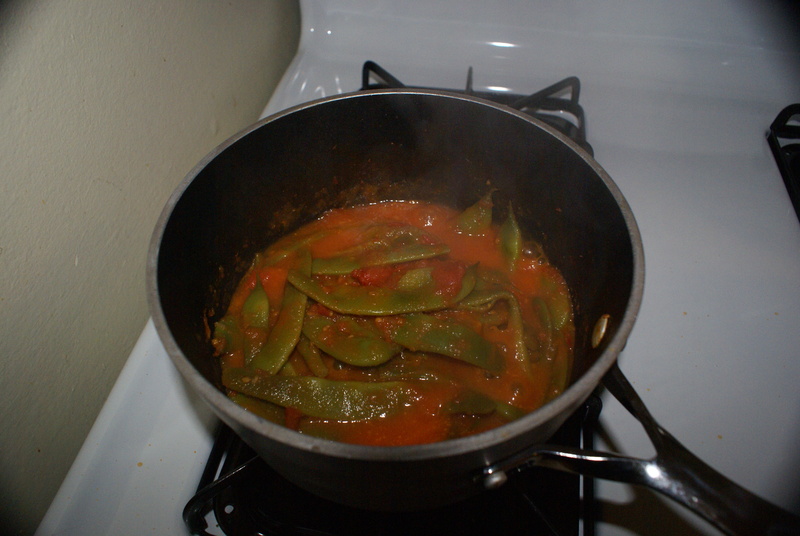 The green beans being thinner would probably fall apart a little bit, while the romano beans are hearty enough to withstand the long cooking process. Heat a medium saucepan over medium heat, add the olive oil. If you’re adding onion or garlic, saute each for a few minutes. Add the tomatoes and turn the heat up to medium high, so the tomatoes are simmering heavily. Cook for 10 minutes. 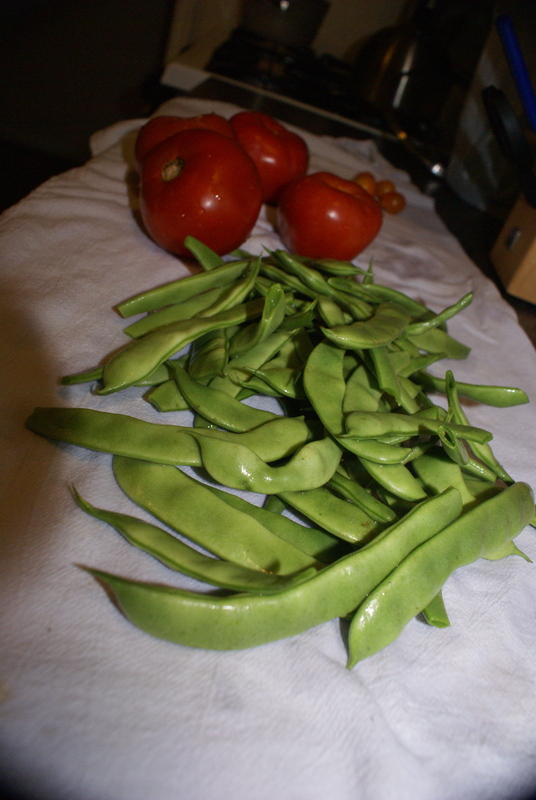 Add the romano beans (you can cut them in pieces or leave whole.) The beans should be mostly submerged in the tomatoes. Turn the heat down to medium-low or medium, so that the pot is still simmering, but not splattering tomatoes everywhere. Cook for at least another 15 minutes with the cover off. The beans will be done when they are soft and tender and a dark army green.